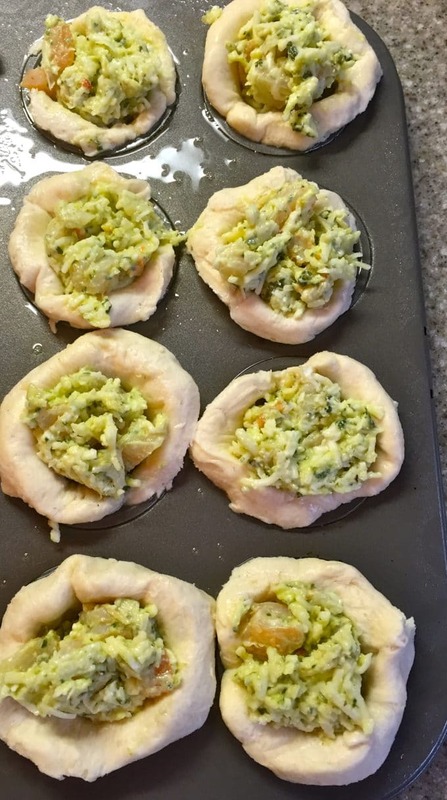 Easy Shrimp Puff Appetizers will wow your family and friends. 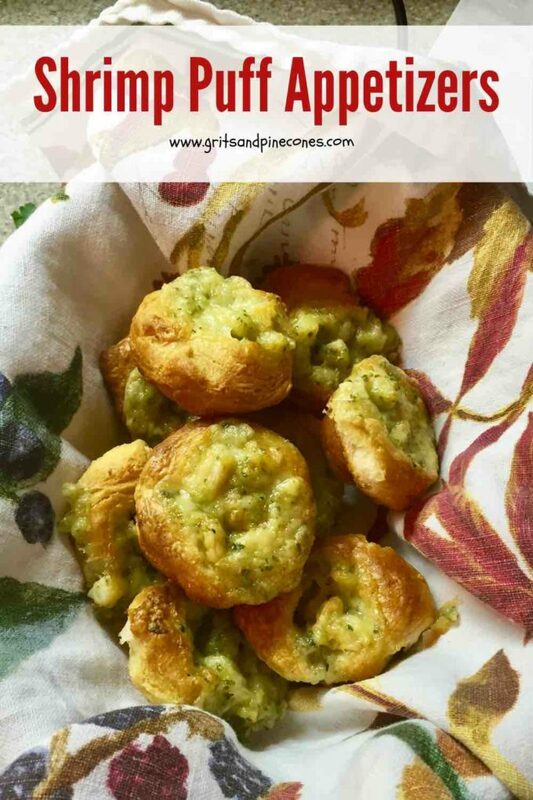 Made from leftover Shrimp with Green Sauce, they are a cinch to make. The secret ingredient is refrigerated biscuit dough! It only takes a few minutes to whip them up and boy oh boy are they delicious! Even if you don’t have the leftover Shrimp with Green Sauce, these scrumptious shrimp appetizers are still very easy to make and only take a few ingredients. In fact, you probably already have most of the ingredients in your fridge right now. So, what are you waiting for? I know some of you are rolling your eyes, and thinking, my New Year’s healthy eating resolutions didn’t last long. We are not even 2 weeks into the New Year. But, part of a healthy eating plan includes a variety of food eaten in moderation along with exercise. So just a couple of these mouth-watering bites along with a salad could make a great light lunch. As you see, I can rationalize most anything….. If you like shrimp appetizers as I do, I know you will love these easy options too! If you have leftover Shrimp with Green Sauce, simply chop up your shrimp and add some shredded Monterey jack cheese, and some mayonnaise. That’s it! I told you it was easy. If you don’t have leftover Shrimp with Green Sauce, all you need for the filling is about a cup of cooked and peeled shrimp, mayonnaise, Monterey jack cheese, and chopped fresh dill or parsley. Chop up your shrimp and mix everything together. Now, take your biscuit dough and divide each biscuit in half, so you will have 2 circles for each biscuit. 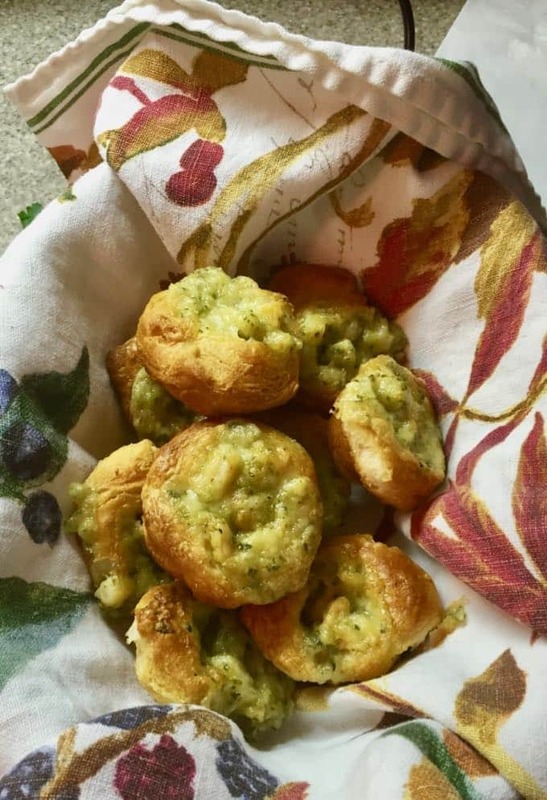 Press your biscuit circles in a mini muffin pan that you have sprayed with non-stick cooking spray and using your fingers, press the dough into the bottom and up the sides of the pan to make a space for your shrimp filling. Then, take about a tablespoon of the shrimp filling and fill up each of your puffs. When all of your biscuit circles have been filled, put in a 350-degree oven and cook for about 20 minutes or so, or until the puffs are golden and bubbling. That’s it! Don’t these look yummy? No one will guess how easy they are. Thank you for visiting my blog! I hope you enjoy it and try some of my recipes. If you are not a subscriber, please subscribe and you will automatically receive an email every time I make a new post! 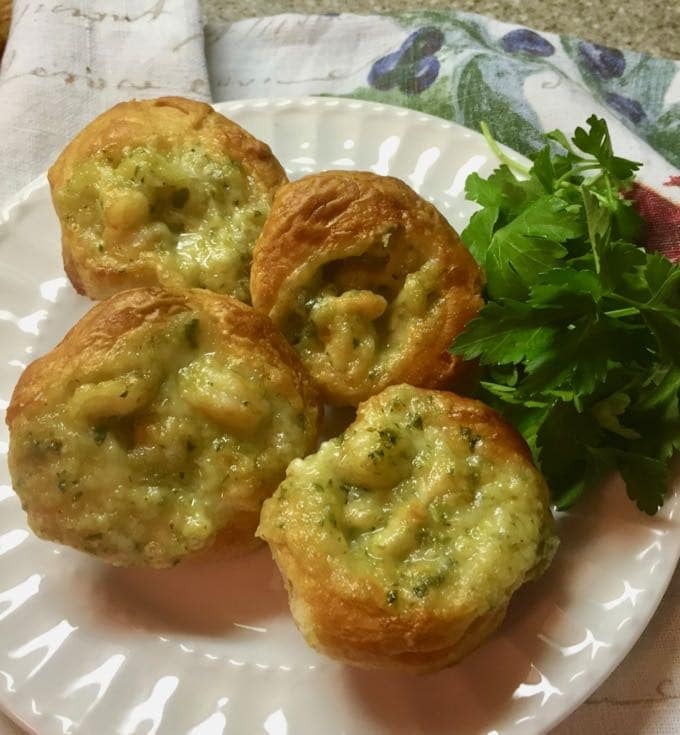 Easy Shrimp Puff Appetizers will wow your family and friends. 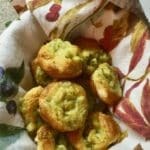 Made from leftover Shrimp with Green Sauce, they are a cinch to make. The secret ingredient is refrigerated biscuit dough! It only takes a few minutes to whip them up! 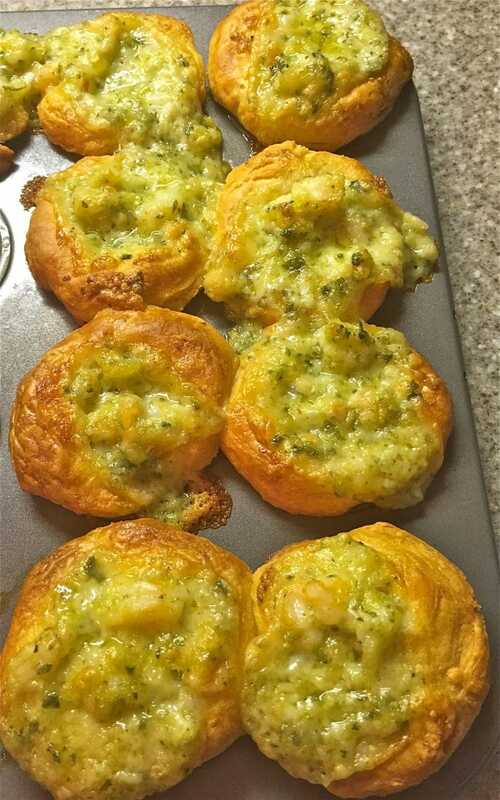 If you don't have leftover Shrimp with Green Sauce, all you need for the filling is about a cup of cooked and peeled shrimp, mayonnaise, Monterey jack cheese, and chopped fresh dill or parsley. Chop up your shrimp and mix everything together. Put in the oven and bake for about 20 minutes, or until the puffs are golden and bubbling.